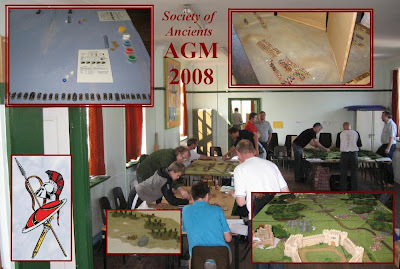 As Shows North, we get to go all over the UK (overseas, too, sometimes) representing the Society of Ancients at Shows, Competitions and Gatherings. I take my camera along to record what we do and to give readers here a flavour of the events. 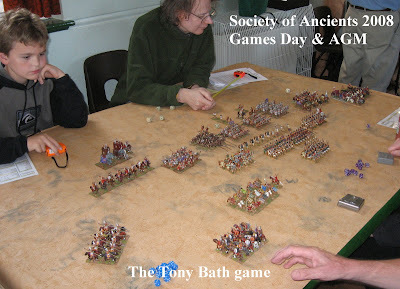 Well, I also took my camera with me when I went down to the Society's AGM and Games Day. Always a worthy event and - these days - an underrated day out. A really good range of games were, as usual, available for visitors to join in (or apologies, in my case, but stand near and discuss ...) - and so I do sympathise with the Committee's conundrum in trying to make the formula work for the 21st century: the idea of an ancients day out is a good one; the combination of games and talks is hard to better ... and if you wanted shopping you would get that, too, if more people came. Oh? The business meeting? Well, I get to chair that at the moment - so it must be good! Actually, I'm sad the formula of the event has become something of an issue ... 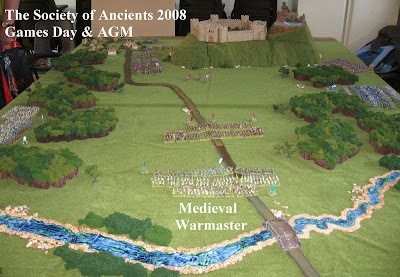 When I first attended a Society of Ancients AGM back in the 1970s, I didn't even attend the business meeting (I was greeted on the door by Charles Grant, bought some figures from Peter Gilder, attended a WRG rules forum with Phil Barker and then got an eye-opening demonstration from Steve Reed on how a 'master' could make a Seleucid army sing and dance). WRG 3rd edition if I recall (he said, pulling on his anorak!). All in all, back in the 70s, I found lots to do and a great mix. Attending the Business Meeting wouldn't even have crossed my mind: OK, I was a full member - but I was also a teenager still at school ... and wouldn't have imagined I would have anything to contribute. I did pop my head round the door, and remember it wasn't particularly well attended - it didn't look like I was missing much! Just as it should be, I'd have thought (just as it still is, really): how interesting is running the Society of Ancients going to be? 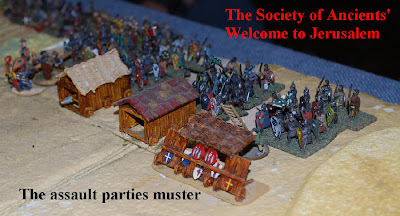 To my mind, the AGM Business Meeting always ought to be something of a minority interest - uncontroversial, and not why most people would join the Society; never likely to attract much more than the minimum it need to function unless some crisis beckons (like e.g. in 1987 ...). The 1970s recollection would be my model for an AGM day, really ... a cracking good day out hosted by an organization so competently (transparently/invisibly) run that no-one would consider the business meeting particularly interesting or important. And so the day would be games, talks, demos etc. re-unions with old friends over a cappuccino, clusters of old soldiers planning grand (fanciful) wargames whilst propping up the bar. Instead, even in a good year, we have the Secretary scurrying around cajoling members through the door to get a head count to satisfy a quorum. 17 times out of the last 20, the number has been exceeded, often comfortably so. But maybe only for quarter - third, maybe - was there anything (genuinely) important on the agenda. I have chaired some of those meetings, and have done so aware that some would like to chew the fat all afternoon, others would rather be elsewhere. Though all are welcome, some have come more out obligation than interest. Focusing obsessively on something that isn't really that important, perhaps the Society risks creating what sports theorists would call 'success phobia' - A good mix in the right place confidently publicised would make a good day out with its own unique buzz. Formulate the whole event wrapped in the concern that the Business Meeting will be inquorate, and guess what happens? Readers who know the SoA's business will know that this year the Committee had put forward a constitutional amendment to remove the formal need for a Business Meeting (AGM) with a quorum - so the event could concentrate less on the needs of the obligatory meeting, and more on the features that entertain the visitors and celebrate - and 'showcase' - what the Society does. It is one of those supreme ironies that the motion which would remove the need for a quorum couldn't be put because the meeting was inquorate! 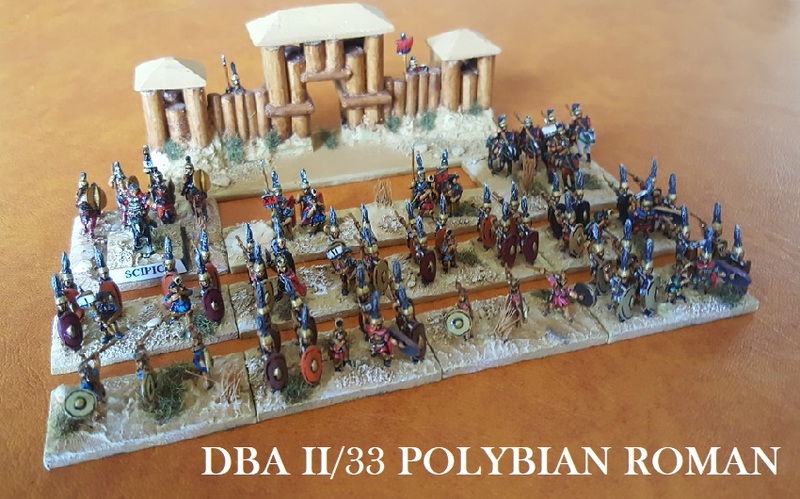 Elsewhere, Phil Sabin and Garrett Mills were taking volunteers through Roma Invicta, and the Armati enthusiasts had brought along a playtest set up featuring a number of rule variants currently being discussed on Yahoo's Armati group. Matthew Bennett gave this year's Games Day talk - on Medieval Cavalry ... and what might be meant by that. An interesting presentation on the theme of the universal soldier which I hope will lead to a Slingshot article. And an interesting follow up to this year's Poitiers Battle Day: Poitiers, of course, where so many Men-at-Arms fought as infantry, but where - following my reading of Froissart, of course - some of the archers under the Captal de Buch seem to have fought as cavalry! Yes indeed, Matthew ... what does cavalry mean in a medieval context? 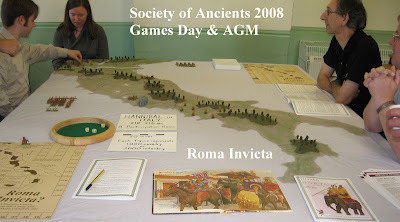 As well as the inevitable meeting and greeting, after the AGM itself, I sat in for a few intriguing turns of the 2nd Punic war as Hannibal Ravaged Italy inconclusively, chatted through the Warmaster activation mechanisms with Grant and Rick, then paid full attention to several bounds of DBMM. Given the inquorate nature of the Business Meeting, we had been able informally to talk at some length about reviving the Championship .. watch Slingshot and the Society Yahoo group - the key will be always be using the wargame (in all its variety) to meet other members and fellow enthusiasts. Because - as I thought was obvious in Farnborough this year - the Society of Ancients is not about procedures and codicils, but about people and shared enthusiasm. 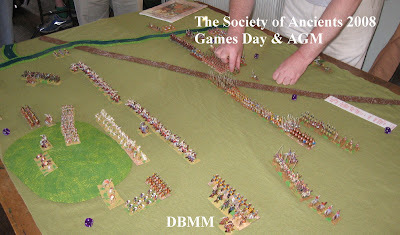 Well, that was my AGM and Games Day 2008. Thanks to everyone who took time out to attend - especially the game presenters and Matthew for the talk. Wherever we confirm for next year's event, I hope to see you there. September always brings the prospect of a pleasant day out at Newbury Racecourse - now the long established home of Colours. It always seems to be a sunny day - and the big windows characteristic of these racecourse venues flood the exhibition spaces with light. Vapnartak is similar. Sometimes this is a disadvantage - especially if you are too near the windows ... but I, for one, would much prefer plenty of natural sunshine to the dismal corners one gets in some pokier spaces. Nice turn out this year, and plenty of good games around - photogenic too. 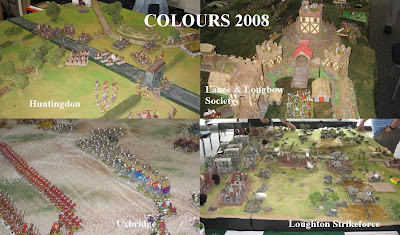 Colours is a two day show, and we usually have the 'A team' - Philip Sabin with something from Strategos or Lost Battles and the impressive Eric Cruttenden 28mm collection (see the entry for Salute, e.g.) to give it shape and figure appeal - on saturday, with Shows North taking over on Sunday. This year, we had a bit of a manpower issue, so I went on both days ... manning the stand on Saturday, putting on Welcome to Jerusalem on the Sunday. A bit of a strain, time-wise, but a great weekend ... affording time both to meet people and work on the project. 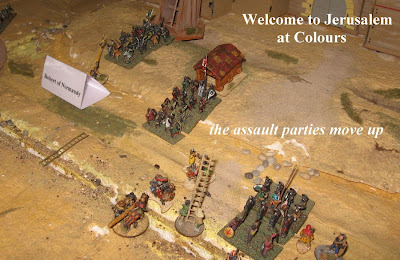 Most of the significant historians and wargames personality of the age were calling in on the Society stand on Saturday, so it was an interesting place to be all day (and if the promises I managed to extract on behalf of our august journal are redeemed, Slingshot will have some good reading coming up!). 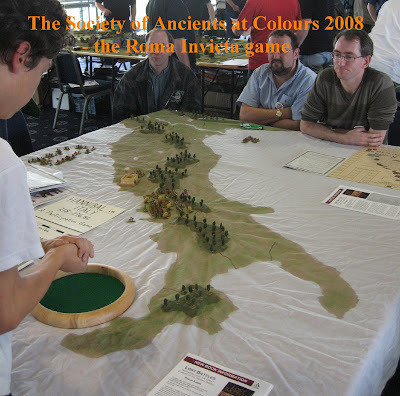 In a very impressive last minute revision, Philip Sabin presented a scaled up version of the new Society game - Roma Invicta ... 6' x 6' of relief map, with 10mm figures replacing the counters used in the standard game. The vast map was created, Phil tells me, following the 'artroom' tradition of fixing the sheet up on the wall, then painting in over an image projected onto it. The effect was them enhanced by building up the back to raise up the contours. Very impressive. The game was virtually the same as that issued out earlier this year, just everything boosted up. 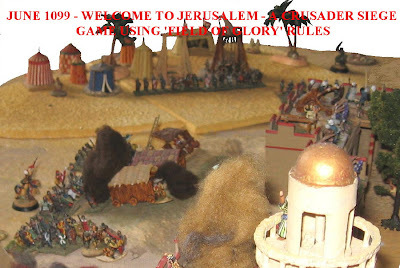 Clearly the way to present a boardgame at a public show - and it attracted a lot of visitors and favourable comment. Good show, and a worthy variation on our usual displays, I think. 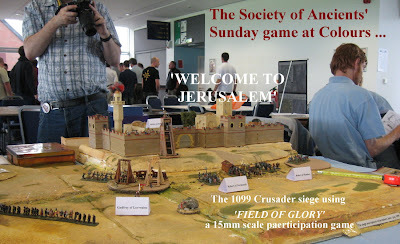 Sunday saw the Shows North team take over, and the up-dated 'Welcome to Jerusalem' game back up to full size. 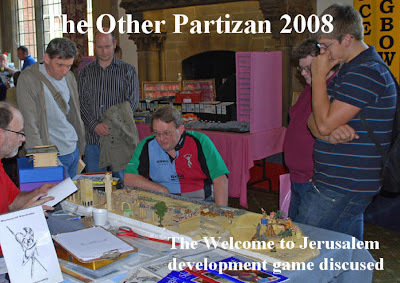 A quieter day, as usual, on the Sunday - but a good chance to play through what we had learnt from the Partizan experiment and put the full display together. The key zone, of course, is the area around the walls, within range, through which the assault parties will move. The garrison needs space to move about inside the city - and some rules for doing this, too ... but outside, and beyond the range of the defenders, the space is very much decorative (and/or available for game components, charts etc.)... As the defenders aren't really going anywhere, there is very little point forming any assault parties up outside shooting range. And it is probably not that realistic either (although they would obviously move up from the camp or whatever, the point at which they would form up for combat would probably be as they come into range of shooters on the walls). This will need to be a deployment feature of any full 'siege system' for FoG. And probably in an ambush variant also (so that surprise attacks can be launched). More anon. 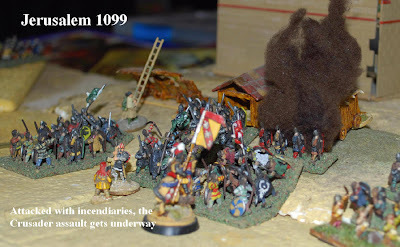 In 1099, of course, the surprise assault failed. 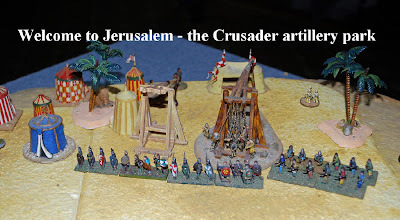 The main attack centred on two mobile towers, one - under the control of Raymond of St Giles threatening the southern approaches - the other, featured in our game, attacking the north east corner. Raymond's tower was burnt by incendiaries, and abandonned. The northern attack was under the leadership of Godfrey de Bouillon. 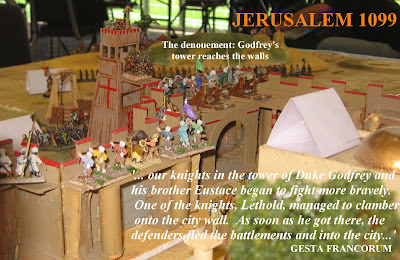 Although his tower was also on fire, it was close enough to the walls for the troops to gain the battlements. As in the game we played at Colours, the successor failure of the incendiary weapons will be critical to the outcome. History seems to give us a tantalising 50/50! Will had taken Godfrey's role, and the tower -largely undamaged - duly gave forth its complement of assault troops. The results were not good for the wavering Fatimid defenders. 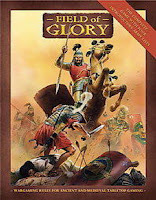 They were put to the sword, and the Crusaders flooded into the city. Elsewhere, the ladder parties were struggling to get a foothold - but the collapses elsewhere undermined the resolve all round. Many thanks to John Curry and Matthew Bennett for important contributions, and to the players for helping us move the project on. Next time out will be at Derby.